Born on February 18, 1925 at Panapitiya, Ruwanwella in the Kegalle District, Beragama Arachchige Shriyaratne Gunasinghe chose to identify himself as Siri Gunasinghe in the 20th century Sri Lankan cultural scene. Reminiscing on his past some time ago, Professor Siri Gunasinghe explained that as a youngster, he was affectionately called "Siriyawa" (Good Fortune) by his mother, shortened to Siri by his immediate family, and that later, he chose to use the short pet name rather than his given name, Shriyaratne. After completing his primary education at the Wickramasinghe Bauddha Mishra Pasæla, Totagoda, Akmeemana, Galle, he continued his secondary education at Mahinda College. Galle. Being academically inclined, he went on to become an outstanding student, excelling in subjects like Sinhala, English, History, Pali and Sanskrit. His academic interests, talents, and outstanding scholastic performance, garnered for him a large number of awards of academic excellence, including Mahinda College's prestigious Kularatne Gold Medal, and the All Ceylon Pali Prize. His early interest in modern Sinhala literature laid the foundation that made him a defining force in the Sinhala Literary scene at a later date. His literary sensibilities were honed and moulded by critical and in-depth reading of the works of early popular Sinhala novelists such as Piyadasa Sirisena, W.A. Silva, and Martin Wickremasinghe, as well as the popular poetic works of the Colombo School of poets. His study of English literature also sharpened his interest in contemporary world literature. It is evident that his attention was especially drawn towards contemporary French an English poetry. At the same time, it may be said that this young scholar's developing world vision was being influenced by the growing leftist activism and ideology of the time. Moreover, his father, though from a fairly well-to-do middle-class background, was a supporter of leftist/socialist politics and this had infused the whole family with socialist/leftist values. 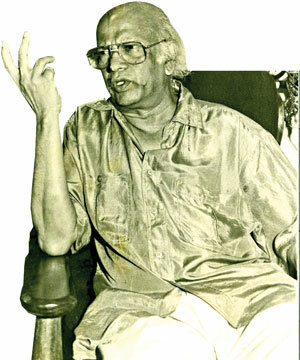 The socio-economic setting that produced the literary personality of Siri Gunasinghe marked a transitional point in the island's socio-political history. Gaining admission to the University of Ceylon (Colombo) in 1945, Siri Gunasinghe took Sanskrit Language and Literature as his chosen area of study. In 1948, he was awarded the Bachelor of Arts degree with First Class Honours, and was appointed to the Sanskrit Department as a lecturer in 1949. Reminiscing on his undergraduate days, Siri Gunasinghe once stated that, at that time, the university community was exclusive, disconnected from the general public, and operated as a "sub-culture outside mainstream society." Based on the excellent results of his GAQ exam, Siri Gunasinghe was awarded the Mudaliar Waidyasekera Pali Prize and the Muncherji Franji Khan Prize for Arts. His performance at the final exams earned him the University of Ceylon Arts Scholarship and the Government of Ceylon University Scholarship for post-graduate study abroad. He gained admission to the School of Oriental Studies, University of London in 1951 and after a brief exploratory stay there, he went on to complete his doctoral studies (1952-1955) at the Université de Paris (The Sorbonne). In 1955 he received his Doctoral Degree with Very Honorable Mention. (Docteur de Université. (Mentiones Tres Honorables)). His dissertation, published in Musee Guimet's Bibliotheque d'Etudes, Vol. 6. 1957 (Paris: Presses Universitaires de France), was titled La Technique de la Peinture Indienne d'apres les texts du Silpa (Technique of Indian Painting According to Silpa Texts). The Siri Gunasinghe who returned to Sri Lanka after completing his post-graduate studies was a person who was not only enriched by his newly acquired academic knowledge; he was also the possessor of an enriched world-view. It may be said that the seeds of this new personality were indeed apparent in his creative persona even before he left the island to go abroad for further studies. Once he recalled how, even as high school students, he and his contemporary, Edwin Ariyadasa, would get together to read and discuss the works of T.S Eliot, W.B Yeats, and W.H. Auden, Ezra Pound etc. His engagement in the systematic study and analysis of both modern Sinhala literature and contemporary English and French literature had produced Siri Gunasinghe, the critic. However, although it is only after his encounter with the transformative socio-cultural conditions and movements in the western world that we see this persona at its full potential, it is, above all, his personal experiences and his sensitivity to, and awareness of, disturbing and poignant socio-cultural realities in his own (i.e., Sri Lankan) environment that triggered his responses and set him on his path to creativity. Siri Gunasinghe leaves his unmistakable and indelible stamp upon the modern Sinhala literary scene because of his clear, unequivocal contribution on two fronts: He redefined the identity of modern Sinhala poetry, and restructured the format of the Sinhala novel. That this contribution is inspired to some degree by the new trends in contemporary western literature is undeniable. However, it would be a mistake to devalue Siri Gunasinghe's transformative contributions as a mere western intrusion, alien and hostile to the indigenous literary tradition, as some critics seem to have done. It must be reiterated that there is ample evidence that, even before he set off for Europe, Siri Gunasinghe had begun investigating and critically evaluating both these areas in Sinhala literature. He saw a disconnect between the realities of modern Sri Lankan life and the tradition-bound contemporary poetry and works of fiction. He recognized the need for a new voice and medium to fill that gap, and found sources of inspiration in the dynamic new-age thinking and writing in the west, as well as in Sanskrit poetics. It can be shown that his inclination towards the genre of poetry known as nisandæs - a term he coined to identify the new poetry, Free Verse, (poetry free of traditional regulatory prosody) - can be traced as far back as 1948. Although his seminal article, "The New Note in Contemporary Sinhala Poetry" appeared in the Observer Annual in 1950, he had already published, in 1949, a poem titled Apasuva (The Return) in the "free verse", nisandæs, style that he was experimenting with, in Aruna, the Journal of the University Sinhala Society. Subsequently, in 1951 he published another poem in the same style titled Iye Sondura (Yesterday's Love) in Piyavara, the Journal of the same society. The publication in1956, not long after his return from Paris, of Mas Le Næti Æta (Bleached Bones), an anthology of poems in the same free verse style, marks a significant juncture in the story of modern Sinhala poetry. It created an enormous hue and cry among the traditional Sinhala poets. The anthology contains 68 pages of 14 poems that shun adherence to traditional metric patterns. The title poem, Mas Le Næti Æta, is divided under five subtitles. The second anthology, Abinikmana (The Renunciation, 1958) contains 35 poems. The third, Ratu Kækula (The Crimson Bud, 1962) contains 78 poems. The title poem, Ratu Kækula, includes 10 subtitled parts. Siri Gunasinghe's fourth anthology, Alakamandava (The Abode of Wealth, 1998) appears 42 years after the publication of the first anthology, Mas Le Næti Æta; the gap of time between the third and the last anthology is 36 years. However, it must be noted that though separated by time and age, these works are akin in form, poetic conventions and the world-view that unify them. Indeed, Siri Gunasinghe does not appear to have wavered, in any significant way, from the poetic course he had laid out for himself at the beginning of his literary career. Hevanælla, (The Shadow), published in 1960 - translated into Tamil as Nilul (Godage Bros., 2008) by Sarojini Devi Arunachalam, and into English as The Shadow (Vijitha Yapa, 2010) by Hemamali Gunasinghe - marks a significant milestone in the history of the Sinhala novel because it sets out on a path so far not taken by Sinhala novelists in the delineation of a character's appearance, behavior and psychological make-up. This narrative mode, identified as 'the stream of consciousness' style, seeks to explore/reveal the inner, mental processes and experiences of the protagonist through the flow of interior monologues. Hevanælla, is remarkable in that it not only captures vividly the socio-cultural environment that has nurtured the characters, but also succeeds in bringing to life the social-psychological forces that motivate them in a totally objective and impersonal way, completely eliminating the third person narrator in the interior monologues. Though several writers attempted to replicate this style in the wake of Hevanælla, they did not succeed in replicating the success of the original. However, because critical attention was extensively focused on the narrative style almost to the exclusion of other elements - the socio-cultural setting, the morality/culture driven conflicts - that are relevant to both the University community and the general public even today, such as the conflicts of value between social classes, between cities and villages, and between tradition and modernity, have received scant attention, by and large. Thirty-four years after the publication of Hevanælla, Gunasinghe's second novel, Mandarama, (The Gathering Storm) was published, followed by his third novel, Miringuva Ællima (Catching the Mirage) eight years later. Mandarama, which may be regarded as a sequel to Hevanælla, deals with the socio-economic, political and cultural changes that occur in the time period immediately following Hevanælla, and the upheaval they wreak upon human lives. Miringuva Ællima explores the destructive effects of a disrupted and destabilized post-colonial society upon a sensitive/vulnerable personality. It can be demonstrated that, as in Hevanælla, in these later works too, the writer is continuing his exploration/experimentation regarding appropriate and relevant language use in creative writing that he had engaged in more than forty years ago. However, the credibility of events and characters that the author had so successfully captured in his first novel, appears to have been diminished in these later works. The world of contemporary Sinhala literature recognizes Siri Gunasinghe's unique contribution to be that of a pioneer/innovator of a new genre of poetry liberated from tradition and convention in format, world-view and modes of expression on the one hand, and of a new mode of fiction writing that introduced the powerful stream of consciousness mode of narration through interior monologues to capture the psychology and inner mental processes of the fictional characters, on the other. However, as important as this contribution, or perhaps even exceeding it, are his scholastic contributions in the areas of literary criticism, Art History, Sanskrit poetics, Buddhist and Hindu art, and architecture. In tandem with these studies Siri Gunasinghe has also devoted attention to explore Indian religions and philosophies. Furthermore, it needs to be said that, as yet, not only have Sri Lankan scholars in these fields failed to appreciate his contribution to this area of scholarship adequately, they have not even given it due consideration. Exploring Siri Gunasinghe's publications in these areas with critical attention will reveal the extent of his contribution to the enrichment and expansion of this field of study. Furthermore, in any study of modern Sinhala usage, Siri Gunasinghe's writings demand attention for reasons beyond their artistic/aesthetic and academic value. This is clearly their relevance to, and influence upon, aspects of modern Sinhala usage and style. Siri Gunasinghe's writings, be they creative or academic, require to be evaluated as works that pioneer a written style that violates the accepted rules of written language use within a language that is clearly diglossic. In Sinhala, a clear demarcation is recognized and accepted between two levels of usage: the colloquial (spoken) and the literary (written) levels. The literary usage is controlled by rigid grammatical/prosodic rules. Literary usage requires the duplication of certain grammatical information in subject and predicate, i.e., in a sentence the subject noun and the finite verb must grammatically agree with each other in gender, number and person. The verb is inflected to agree with the subject. In colloquial usage, such agreement is redundant and the verb keeps one form regardless of grammatical distinctions in the subject. Apart from this, the two levels also exhibit lexical differences as well. Linguists believe that this diglossic situation would have been established in Sinhala at least from about the 12th century CE. In Siri Gunasinghe's Hevanælla, however, a closer affinity with the colloquial idiom is evident in the language of dialogues; but, overall, the language and style he uses is recognizably a blend of the literary and colloquial modes. Furthermore, the author also tends to use structures that are more in keeping with colloquial usage, disregarding the formal grammatical rules that constrain the language at the literary level. Thus, in both dialogue and narrative, the dominance of elements of colloquial usage is clearly evident. This is not only typical of his creative writing; as noted above, it also prevails in his academic writing as well. Around the 1960's Siri Gunasinghe took pains to point out, while discussing contemporary literary language use, that "traditional formal grammar" had "little or no usefulness", and that abandoning such a "grammar" can in no way be regarded as "inflicting a loss or blow to the language". Similar to his treatment of traditional "formal grammar", his use of Sinhala orthography is also clearly unorthodox. Since the symbols (K and <) used in the Sinhala alphabet to represent the retroflex [n] and [l] sounds do not represent sounds actually articulated and identified in Sinhala speech, Siri Gunasinghe advocates, and practices in his writing, the elimination of these extra symbols (in the interest of simplification), and the use of the symbols ( k and , ) that are currently used to represent the dental [n] and [l] in all instances. This is a clear departure from the traditionally accepted system/rules of orthography. Gunasinghe's advocacy and practice of transposing the colloquial (spoken) into the literary (written) levels of language register, and his disregard and violation of the established orthography have irritated many traditionalist scholars, as well as many average readers. It is also no secret that certain writers and newspaper editors, hiding behind aliases of one kind or another, have produced articles and books to attack his unorthodoxy. The informal colloquial language that drives the interior monologues and much of the narrative and dialogue in Hevanælla, presents a striking departure from the style of other novels that had been published so far, and demonstrates yet another instance of Siri Gunasinghe's undeniable and decisive impact upon the language of Sinhala fiction. In the decade of the sixties itself, several novelists were inspired to follow this innovative style when crafting their work. The direction that Siri Gunasinghe took, and set, with regard to the language of poetry can be said to be even more innovative. The novelty of the form and the world-view exhibited in his poetry was discussed earlier. In 'language' use Siri Gunasinghe's poetry shows little affinity either to formal 'literary' usage or to informal 'colloquial' usage; it is also quite removed from the concept that there is a language exclusive and essential to poetic expression. In his poems, Siri Gunasinghe crafts the language as a blend of literary and colloquial usage, appropriate and integral to content and purpose, and capable of generating a kind of wonder and enjoyment in the reader. Siri Gunasinghe's contributions enrich not only the academic and literary spheres; his innovative contribution to other genres like the Sinhala feature film, documentary film, and docu-drama, contemporary theatre, TV and radio, and finally painting is widely known. The artistic and technical knowledge and training he acquired at the UCLA Film Department while on a Rockefeller Foundation Research Fellowship is evident in his direction of the award winning film Sath Samudura (Seven Seas) as well as in the artistry of his documentary film Ranvan Karal (Golden Grains). He directed the teledrama, Guttilaya, for ITN in 1995 and also wrote the screenplay for the UNESCO film dramatization of the Life of the Buddha. He has conducted TV programmes such as Kavi Dækima "Encounter with Poets and Poetry" on Rupavahini, He has also produced Sinhala radio plays, and written and presented several programmes on literature and the arts for Radio Ceylon/SLBC and BBC. He has contributed many articles in both English and Sinhala on the current Sri Lankan literary and cultural scene in the local press and journals. Siri Gunasinghe is also recognized for designing innovative and trendsetting costumes and make-up for Ediriweera Sarachchandra's Maname, Kadavalalu, Rattaran, and Elova Gihin Melova Ava, P. Welikala's Rathnavali, Gunasena Galappatti's Sandakinduru, and Hemamali Gunasinghe's Turanga Dæn Dæn Handata. Siri Gunasinghe also engages in Impressionist inspired painting as a pastime. Some of his works have been exhibited here, at home, and abroad. Some of his artwork can be seen on the covers of his published works. On the invitation of the Department of Cultural Affairs Siri Gunasinghe did a survey of Medieval Paintings in Sri Lanka and submitted two detailed reports of his findings. However, they did not receive adequate or proper attention. Although one of these reports was published three decades later, the other, with its supporting photographs (by photographer Dunstan Silva), have disappeared into the sands of time. After a similar survey of the Paintings of the Kandy period, he published a report on the archaeological sites that contain them as a publication of the National Museums Department. Among his publications is a small but interesting monograph on Sri Lankan masks. Even after retiring from the University of Victoria in Canada, of which he is an Emeritus Professor, Siri Gunasinghe continues his association with institutions of higher learning, and is still committed to both creative and academic writing, as well as research and travel. He continues to write and publish in English and Sinhala. His latest work, Sigiriya: Kassapa's Homage to Beauty (Vijitha Yapa, 2008) was translated by him into Sinhala in 2010 as Sigiriya: Kassapage Saundarya Pujawa (Vijitha Yapa). Siri Gunasinghe remains a living force, an unceasing ocean of creativity and an overflowing fountain of knowledge enriching the world of Sinhala literature and the arts.